The purpose of this article is to discuss cat bites, cat anger and related cat behavior problems. We cover basic first aid and the appropriate actions to take if you are bitten by a cat. Cats are among the most lovable animals and are among the most usual pets domesticated in households. However, it is inevitable that in several occasions, you, someone from your family or guests might be bitten by the animal for whatever reason. Cat bites are no ordinary wounds. Proper care and attention must be given to the cat bite to avoid complications and potential health risks. Basically, the main concern of people getting cat bites would be the onset of rabies. However, in the United States, health experts and animal monitoring agencies assert that cats are not infected with the rabies virus. But to ensure overall safety, the feline bite victim must take precautionary measures to avoid possible viral infection. Rabies shots must be administered to the patient as soon as symptoms of rabies infection manifest in the cat. Once a cat bites, the victim must immediately ask the cat owner about the vaccination record of the animal. Otherwise, since the probability of rabies infection in cats in the United States is low, the cat could simply be left alone and be observed for about 10 days after the biting incident for signs of viral infection. If rabies is found in the cat, the victim must abruptly seek medical help. Rabies virus is one of the most fatal microorganism that can induce death. Within a few days, the cat bite can cause serious result and even death. First aid measures must immediately be done abruptly after a cat bite is acquired. The cat bite should be primarily handled like an ordinary serious wound. The first thing the victim should do is to clean the cat bite very thoroughly with clean water and hygienic soap. When cleaning the wound, it would be better if the water is running. The process may hurt a little, but is really necessary. Because cat bites are serious wounds, it is normal that they would cause excessive bleeding. After cleaning the wound, the next necessary measure would be stopping the bleeding. You can simply apply pressure using a clean towel on the injured body area until the bleeding subsides. The wound would normally stop bleeding after the action. Otherwise, if bleeding continues after 15 minutes, immediate medical help should be abruptly sought. When the bleeding is controlled, a sterilized bandage must be applied to the wound. The bandage would serve as a pressure point that would stop and prevent further bleeding. Other than that, the bandage would also serve as a protection for the cat bite for further contamination from microorganisms in the surroundings. To prevent infection and unnecessary swelling, the bite should be elevated in a way that the injury is above the heart level. The technique is proven to help avoid swelling and serious infection. If the cat bite is placed in the leg, just leave it with the bandage. To prevent infection, antibiotic ointment must be regularly applied, at least twice a day, to the cat bite and the surrounding area. There are antibiotic ointments that are also coming with pain relief ingredients and fast-healing properties. Antibiotics in tablet or liquid forms should be taken until the cat bite completely heals. However, taking such medications should be overseen and prescribed by a doctor to prevent potential problems. After the first aid measures have been administered, the patient must still see a doctor to seek help for the complete treatment of the cat bite. Anti-infection medications should be administered as well as anti-rabies shots, if needed. People with diabetes, cancer, liver or lung ailment and acquired immunodeficiency syndrome or AIDS must consult their doctor immediately. Such medical conditions weaken the body's overall ability to combat infection. In some cases, tetanus shots must also be administered because the cat bite might be infected with tetanus virus. Tetanus is another viral disease that must be avoided because it is really fatal. You should also report the incident to animal control authorities especially if the cat is stray. The cat must be captured for observation for rabies infection. Having the cat quarantined will also help ensure that the cat will not be able to victimize other people. Cats are not considered harmful animals, but it would still be advisable to do precautionary medical measures once you get bitten by one. Do You Love Cats? See The Cat Quote Book! 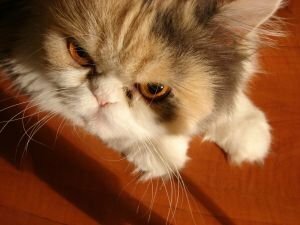 Do You Have An Angry Cat?